The festival is a collaborative space for citizen science, DIYbio, art-tech, academia, entrepreneur and maker cultures. It is a part of Science in the City during ESOF2014. The exhibition “Please Try This at Home” is an open invitation to explore the interdisciplinary universe where art, science and technology cross-fertilize and form a creative environment for development of new ideas, experiments and inventions. In ancient times the development of events beyond a person’s control was determined by a supernatural power. Mythological characters like the Norns ruled people’s destinies, but today we have changed our faith in gods for faith in computers and have thus substituted beliefs for rationality. We believe computers can analyze human nature and tell us what to do, but this is a machine fantasy, a dream of the machine. 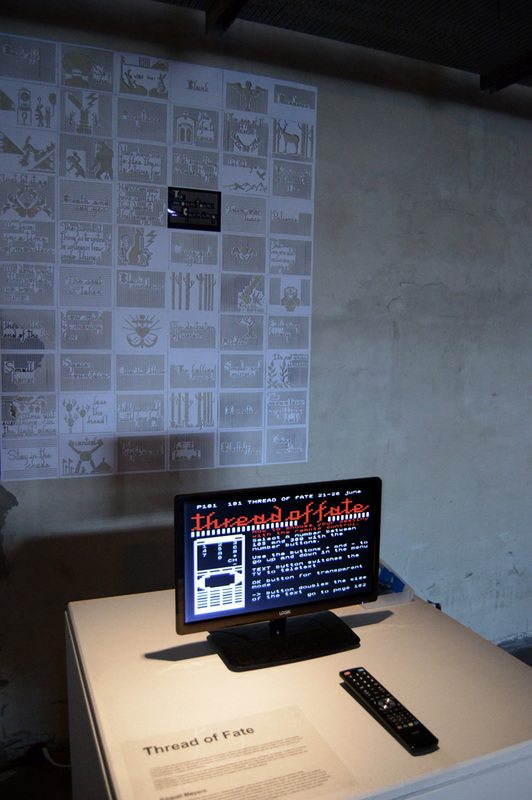 Raquel Meyers “Thread of Fate” is screenbased teletextcombined with laser cut teletext pages in paper and cross-stitch. Teletext is a means of sending pages of text and simple geometric shapes from mosaic blocks to a television screen. It offers a range of text-based information, typically including news, weather and TV schedules. At the exhibition you are invited to interact with the screen and enter a number from 104 to 300 in order to predict your destiny with teletext.